Semiconductor physics, quantum electronics and optoelectronics, 21 (2), P. 114-124 (2018). Semiconductor physics, quantum electronics and optoelectronics, 21 (2), P. 125-129 (2018). Semiconductor physics, quantum electronics and optoelectronics, 21 (1), P. 130-133 (2018). Semiconductor physics, quantum electronics and optoelectronics, 21 (2), P. 134-138 (2018). Semiconductor physics, quantum electronics and optoelectronics, 21 (2), P. 139-151 (2018). Semiconductor physics, quantum electronics and optoelectronics, 21 (2), P. 152-159 (2018). Semiconductor physics, quantum electronics and optoelectronics, 21 (2), P. 160-166 (2018). Semiconductor physics, quantum electronics and optoelectronics, 21 (2), P. 167-172 (2018). Semiconductor physics, quantum electronics and optoelectronics, 21 (2), P. 173-179 (2018). Semiconductor physics, quantum electronics and optoelectronics, 21 (2), P. 180-186 (2018). 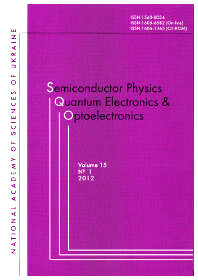 Semiconductor physics, quantum electronics and optoelectronics, 21 (2), P. 187-194 (2018). Semiconductor physics, quantum electronics and optoelectronics, 21 (2), P. 195-199 (2018). Semiconductor physics, quantum electronics and optoelectronics, 21 (2), P. 200-205 (2018). Semiconductor physics, quantum electronics and optoelectronics, 21 (2), P. 206-210 (2018). Chinese company CETC JR Tianjin Laser Technology Co., Ltd.
Semiconductor physics, quantum electronics and optoelectronics, 21 (2), P. 211-212 (2018). Semiconductor physics, quantum electronics and optoelectronics, 21 (2), P. 213-215 (2018). Semiconductor physics, quantum electronics and optoelectronics, 21 (2), P. 216 (2018). Semiconductor physics, quantum electronics and optoelectronics, 21 (2), P. 217 (2018).